A pretty hand colored engraving of “Richmond VA and its Vicinity”. The image is 8″ wide by 6 3/4″ tall. 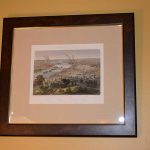 The frame is 15″ wide by 13 1/4″ tall. It has been beautifully framed in acid free matting. 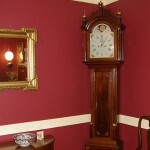 A wonderful, Mahogany Tall Case or Grandfather Clock. This clock was made by the renowned clock maker Aaron Willard in Boston, Massachusetts before 1800. Johnson chair from Mecklenburg County, Virginia. Made by a member of the Johnson family. These chairs have been long sought after for their functionality and durability. This is a copy of the map of Virginia out of Captain John Smith’s 2 volume series that he published in the 1620’s. It was reproduced from the original plates in 1819 in Richmond, Virginia. 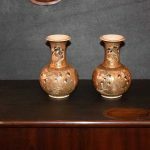 A pair of three 19th century Armed Silver Plate Wall Sconces. British. Circa 1840. 11 1/2″ tall, 6 1/2″ wide, and 8″ deep. 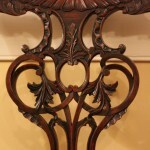 An Impressive set of Eight Chinese Chippendale Chairs with straight legs. Consisting of six sides and two arms. The finish is completely original on all of the chairs. Circa 1780. English.